Amphibians and reptiles are the most numerous, diverse, and frequently encountered animals on the Caribbean islands. This book provides a variety of perspectives on this amazing group of organisms. 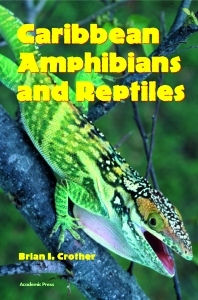 Caribbean Amphibians and Reptiles, compiled by an international team of zoologists, takes a fresh and detailed look at the complex biological puzzle of the Caribbean. The first true overview of the islands, it includes a historical examination of the people who have studied the Caribbean amphibians and reptiles. The book reviews the ecology, evolutionary history, and biogeographic explanations for the origins and diversity of the region's fauna with island-by-island coverage. It puts the Caribbean in perspective by comparing the islands to Central America and its amphibian reptile diversity. Additionally, the book includes figures, tables, and color plates which bring to life some of the region's most spectacular creatures. Professional and amateur herpetologists, ecologists, evolutionary biologists, biogeographers, and biologists interested in the natural history of the Caribbean. E.E. Williams, Over 300 Years of Collecting in the Caribbean. A.R. Ruibal and R.Ruibal, A Review of Cuban Herpetology. R. Powell, J.A. Ottenwalder, and S.J. Inchaustegui, The Hispaniolan Herpetofauna: Diversity, Endemism, and Histical Perspectives, with Comments on Navassa Island. R. Thomas, The Puerto Rico Area. E.J. Censky and H. Kaiser, The Lesser Antillean Fauna. R.W. Henderson and R. Powell, West Indian Herpetoecology. G.K. Pregill and B.I. Crother, Ecological and Historical Biogeography. W.E. Duellman, The West Indies and Middle America--Contrasting Origins and Diversity. Plates. References. Index. Brian I. Crother received his B.A. from California State University at Dominguez Hills and his Ph.D. from the University of Miami, Florida, where he was a Maytag Fellow. His doctoral work involved studying the evolutionary history of Caribbean snakes. He continued his evolutionary history work at the University of Texas at Austin, where he was also curator of the reptile and amphibian collection at the Texas Memorial Museum. He is now an Associate Professor in the Biology Department at Southeastern Louisiana University. He has published numerous technical papers and book chapters and is the Editor of Herpetological Monographs. He has also been listed in the National Who’s Who of Teachers and has received extramural funding of his research from several sources, including the Jesse Noyes Foundation and the National Science Foundation. Southeastern Louisiana University, Hammond, U.S.A.